Sean O’Shea is ready to build on a bright start to his career in the green and gold. Seán O’Shea takes a free during the Super 8s. 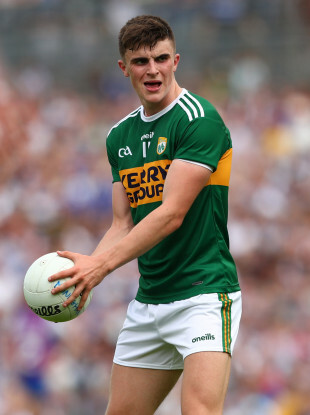 DAVID CLIFFORD ARRIVED into his debut campaign with Kerry seniors last year with a great degree of hype, which he more than justified by landing All-Star and Young Footballer of the Year honours at the end of the year. But the excitement surrounding Clifford meant he took the attention firmly off the shoulders of Kerry’s other debutant in attack – Kenmare ace Sean O’Shea. When Kerry opened up their league campaign against Donegal last January, it was the former All-Ireland minor winning captain who wowed the crowd with a seven-point haul as he pulled the strings from number 11. O’Shea, who won minor crowns in 2015 and 2016, enjoyed a fine year in the green and gold and looks to be the long-term answer for the Kingdom at centre-forward. He was first called into the senior set-up by Eamonn Fitzmaurice in the summer of 2017 but saw no action on the field. Once his chance came last year, he grasped it with both hands and quickly established himself as a regular starter through the league and championship. “Whenever you get called into Kerry, you’d be nervous about it the first night,” says O’Shea. “Having the few fellas there that you knew and would talk to (helped). “You could pop a message at them to see what the craic was like, to see what the set-up was like as well. That helps to guide you through the first few sessions and that too. “Eamonn was great. Eamonn gave me my first start in both the league and the championship so I owe a lot to Eamonn. “All the finer details, he really looked after them. Things didn’t really look out for us last year, (that was down to) the performances from the players more than anything else. The backroom team was exceptional, they looked after every last detail. The average age of the Kerry set-up has dropped significantly since Peter Keane’s appointment as Fitzmaurice’s replacement. Four veterans retired over the winter - Kieran Donaghy, Anthony Maher, Darran O’Sullivan and Donnchadh Walsh – while Fionn Fitzgerald and Barry John Keane are no longer part of the panel. “There’s been four notable retirements,” he says. “It’s a younger squad than usual but us younger lads would want to be stepping up into leadership roles now too. “Kerry is known for producing forwards. It’s tough and you always have to be on your toes in training trying to get a jersey or hold onto a jersey. You’re playing with some of the best forwards in the country. “Every night training there is competitive, just battling to get on the team for the league, no one takes the foot off the pedal at all,” O’Shea added. The final year UCC Arts student worked under current Kerry boss Peter Keane for a season at minor level, lifting the Tom Markham Cup together in 2015. “He’s been in charge of the last three winning minor teams. He’s been there on All-Ireland final day and he’s got that experience. “I had a year (of) minor with Peter so I know him well enough. He’s very good and looks after us very well. He has a good backroom team around him and it’s good, I’m looking forward to it. Email “First-night nerves at Kerry training, owing 'a lot' to Fitzmaurice and working under new boss Keane”. Feedback on “First-night nerves at Kerry training, owing 'a lot' to Fitzmaurice and working under new boss Keane”.